Encroachments on government land, including lakes, shot into front page news with the demolition drive at Sarakki Lake in JP Nagar 7th Phase, in April 2015. Eviction drives and attempted drives have been happening in Bangalore on and off. For example, in September 2014, Venkatarayana Lake was cleared of some illegal structures, and in January 2015 HRBR Layout residents received eviction notices as their homes were on lake beds. In both these cases, the Bangalore Development Authority (BDA) was a common factor, being the reason for the encroachment in the first place. Following the Sarakki Lake demolition, it was brought to light that several parts of Bangalore were under risk, mostly developed by the BDA, on erstwhile lake beds. In this context, the government was considering regularising buildings on dead lake beds. It then decided to halt anti-encroachment drives near lakes pending the lake encroachment enquiry report of the Koliwad Committee, a committee set up in October 2014 (still pending). Very recent reports indicate that the government is going to regularise encroachments on government lands, a step that could offer relief to lake encroachments too. Bangalore’s lakes, in April-May 2015, made it to international news, but not for any good reasons. Water pollution at its pinnacle, has resulted in bubbling foam at Varthur Lake and Bellandur Lake, two large lakes of the city. Sparks on the toxic waste in the Bellandur waters in fact set the lake on fire a few times in May! As recently as a couple of days ago, foam was still flying onto the roads and into homes around the Bellandur Lake. Sarakki Lake too experienced foaming earlier this month, due to “effluents and sewage” and the Karnataka State Pollution Control Board (KSPCB) is investigating. Starting 22nd June 2015, The Hindu newspaper is carrying a series of five articles on deterioration and depletion of lakes and open wells in Bengaluru. The articles have been written by faculty members of the Azim Premji University and the Ashoka Trust for Research in Ecology and the Environment, based on their research. The first article, by Harini Nagendra talks about how “Epigraphical inscriptions found on hero stones, temple foundations, pillars, and metal plates reveal the origins of lakes in Bengaluru.” Harini says, “Over time, the social prestige associated with community work for creating and maintaining lakes has become eroded. We need to draw on some of these practices to move towards a resurgent community-oriented practice of lake management.” The full article can be read online here. The second article, published today, tells the story of Sampangi Tank, a small part of which still exists, and where the Kanteerava Stadium now lies. “The lake though reclaims its identity during monsoons, when it collects water as a low lying depression, no matter its name. Nature, as always, has the last word.” The full article can be read online here. Look out for the next three articles in The Hindu over the next three days. The Brigade Group (builders) has rejuvenated the Sitarampalya Lake in Whitefield using its Corporate Social Responsibility (CSR) funds. The lake is to be handed over to the BDA soon. “With things much in place now, the lake will need just three rain cycles to be restored to its past glory”. Kacharakanahalli Lake in Lingarajapuram has been under threat for a while, mostly because of dumping by the BDA, who should have been safe-guarding it. 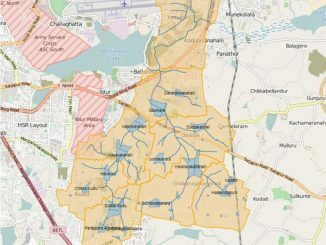 According to a recent report in The Hindu, “The State government is likely to declare Kacharakanahalli lake to have lost all characteristics of a lake and use the 53 acre land to provide amenities like a playground, parks and a college.” This ‘lost characteristics’ is true for many lakes, but should not be a reason for not saving a potential source of water supply. Development of infrastructure, such as the Kanteerava Stadium, has been the reason for the sacrifice of many lakes in the past, and one hopes, for the good of the city, that Kacharakanahalli Lake has the same luck as Sitarampalya Lake. For more news on Bangalore lakes, check out Citizen Matters “lakes” online here.